For the past three years, I have been the team leader for the Georgia Tech RoboJackets Small Size RoboCup team. RoboCup is an international robotic soccer competition designed to drive research in robotics, multi-agent systems, artificial intelligence and the systems which compose those fields. 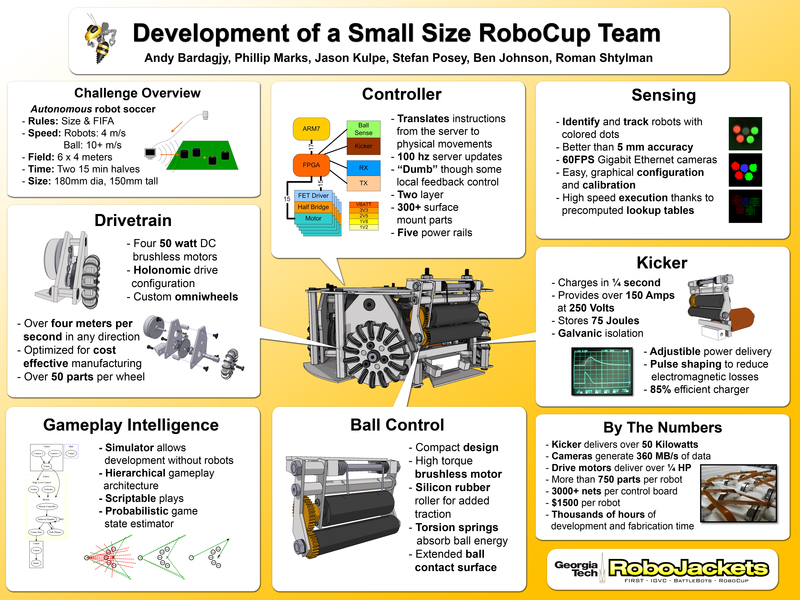 The stated goal of the RoboCup Federation is to defeat the (human) World Cup soccer champion with a team of autonomous robots by 2050. I think this date is probably too pessimistic. In the league, two teams of five autonomous robots play soccer with an orange golf ball in two fifteen minute halves. The robots routinely travel in excess of four meters per second, and the ball can exceed fifteen meters per second (33+ mph!). Due to size restrictions (the robots must be 180 mm in diameter), significant integration and power issues rarely seen in traditional robotics, must be overcome. Additionally, the fast paced fully autonomous nature of the game requires sophisticated control systems such as path planning, obstacle avoidance, strategy and artificial intelligence systems. As a result of their small size, the robots are highly integrated. Every component of the robots are developed specially for this competition. Furthermore, extremely sophisticated control and autonomy algorithms are required to play competitively. I cannot drive our robots nearly as well as our algorithms can. A pair of high-speed (60 or 90 fps) cameras track the colored dots on the tops of the robots (our team and theirs) and the ball (an orange colored golf ball). 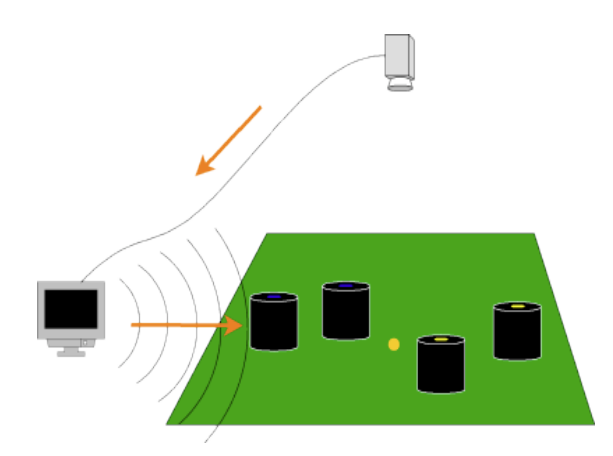 With this information, our computer system off-field sends gameplay decisions to the robots on the field wirelessly. Circuitry on the robots interprets the information transmitted by the computers and drives four 30 watt brushless motors attached to omniwheels. The omniwheels allow our robots to translate in any direction at around four meters per second. Much more information can be found below in my presentation, publications, or the project wiki. As team leader, my job was to oversee every technical aspect of the system to ensure proper system integration. In addition, I also served as the electrical team lead. As the electrical team leader I designed and fabricated custom motor and solenoid control circuitry. 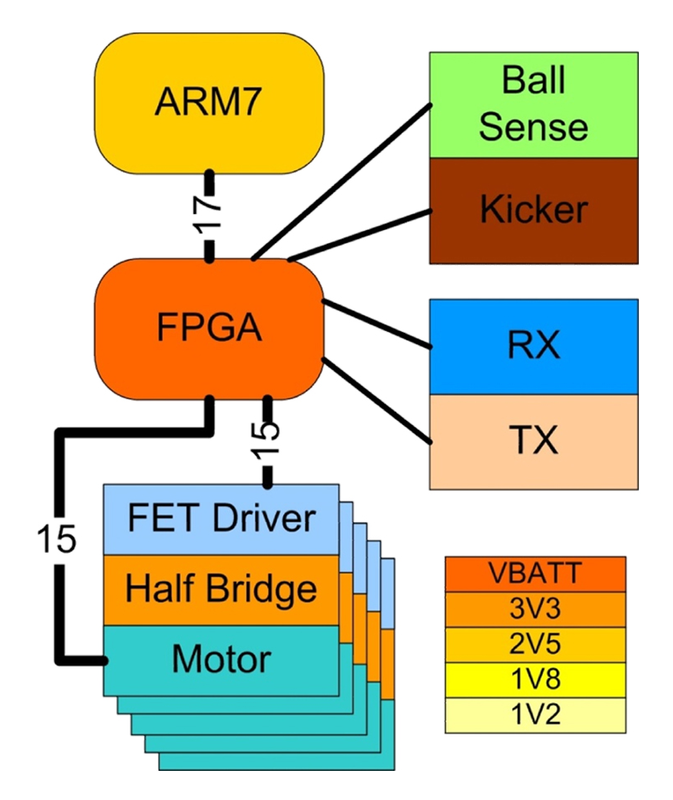 The motor control circuitry was composed of an ARM 7 processor mated to a XILINX FPGA which drove thirty MOSFETS arranged as fifteen half-bridges. The solenoid driver circuitry charged a bank of capacitors to kick the ball via a solenoid. With this circuit we were able to achieve peak power of nearly 100 kW. As the team leader, my duties include fund-raising, travel coordination (we competed in Atlanta, Georgia, Suzhou, China, Boston, Massachusetts, and Pittsburgh, Pennsylvania) and scheduling. In 2008, I oversaw a yearly budget of roughly $50,000. Additionally, I coordinated integration efforts among the different subsystems. After struggling our first season, we went on to place second at the 2009 US Open, thoroughly thrashing MIT/Harvard and holding our own against CMU. I demo our team at Robotics Sciences and Systems 2007, Atlanta, GA.
Georgia Tech College of Computing 2007 and 2008 Undergraduate Research Opportunities in Computing Symposium. In 2008 this project won the best poster award. 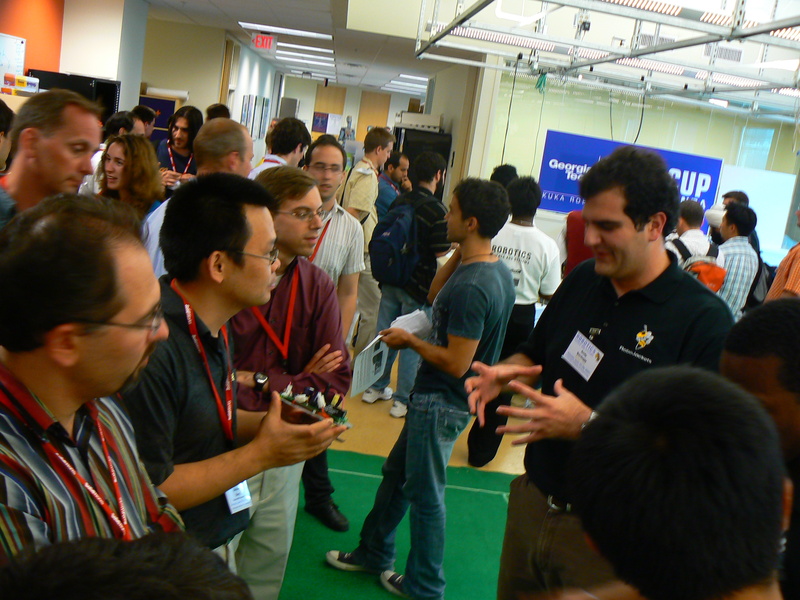 The Georgia Tech Electrical and Computer Engineering 2007 and 2008 Undergraduate Research Symposium. In 2008 the project won the people’s choice award. The Georgia Tech Student Advisory Board for Undergraduate Research Spring Symposium. The Spring 2009 Undergraduate Research Kaleidoscope. The Kaleidescope was given Pecha Kucha style (20 slides 20 sec each). This was the first time I have given a talk like that, it was fun :). 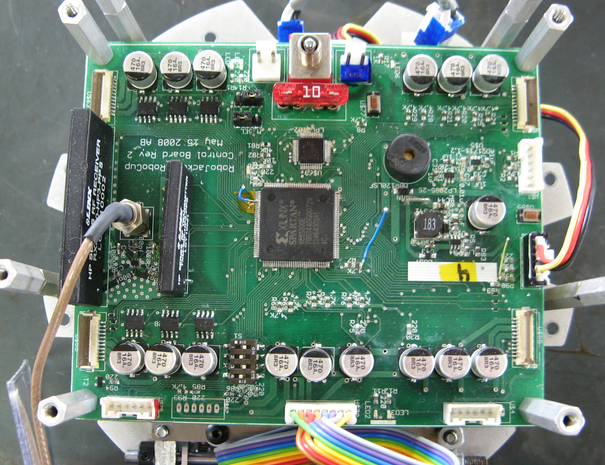 A formal overview of the project can be found in the proceedings of the 2007, 2008, and 2010 RoboCup conference.